There's no shortage of .NET 4.5 related books at Packt publishing. 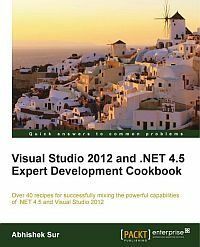 The latest one that I just read after getting a free review copy was Visual Studio 2012 and .NET 4.5 Expert Development Cookbook written by Abhishek Sur. Soon after I started reading the book it stood out to me that this wasn't a typical cookbook style book, although it followed the same basic structure. Individual recipes are not all that isolated within a chapter, making the book more suitable for reading each chapter from beginning to the end instead of seeking out individual recipes of interest. It's not something that bothered me in any way, but I thought it was worth mentioning, nevertheless. The book addresses a lot of advanced topics throughout the chapters, as expected based on the target audience of experienced .NET developers. Still, most of the chapters include some basic topics as well, which in my opinion unnecessarily slow down the pace. The same goes for a couple of too lengthy samples for my taste. I also thought that the two Windows 8 chapters stand out a bit from the rest, having a greater share of basic topics. I'd prefer them being more advanced like the other chapters are. While I understand that this is a new framework for Visual Studio 2012 and .NET 4.5, I still think that the target audience would benefit more from a greater diversity of Windows 8 related advanced subjects. The book left me with mixed feelings. I rather liked it because of its broad spectrum of advanced topics, even though they weren't covered in all that much depth. For the stuff that I didn't know about before and sparked my interest enough, I had to do some further research and reading to learn about it enough for my needs. I didn't mind that, but one could argue the book should provide such knowledge on its own. Still, I would recommend to any experienced .NET developer interested in learning more, to read or at least scan through the book in spite of some of its flaws. It should be worth the time invested.